My business partner and I have decided to purchase this bag to help promote our business. We should out on this bag at our latest convention. Thank you so much CEP. If you are in the market for a versatile and durable bag, look no further than our Heavyweight Promotional Cotton Tote Bag! Made of 14 oz heavyweight cotton canvas, it is remarkably sturdy and can hold virtually any contents, especially when you consider its large 13" W x 13" H x 5" D size. A sizeable imprint area is available where you can place the design or message of your choice and it will vividly stand out due to the subtle natural color of the bag! Our Heavyweight Promotional Cotton Tote Bags is one of our most versatile bag options, mainly because of its durability and size! It is especially perfect as a wine or grocery tote due to the two sewn-in bottle holders. It can also be used during a day at the beach or when your customers are out-and-about. Comfortable 22" handles are included so you will not strain no matter what you are carrying. This bag also includes a large 8" W x 8" H imprint area where you can best showcase your brand! This bag arrives in a large size and includes sizeable 5" gussets. When you couple its size with the durable 14 oz cotton canvas with which the bag is constructed, you can place pretty much anything within the bag's confines and not worry about rips, tears, or normal wear-and-tear! 22" handles makes carrying comfortable, no matter how heavy the bag ends up being! The versatility of this bag is increased when you consider the two sewn-in bottle holders, which could help when your customers are visiting the supermarket or a local winery! An 8" W x 8" H imprint area is included where you can best broadcast your brand's message to your customers, and potential customers as well! 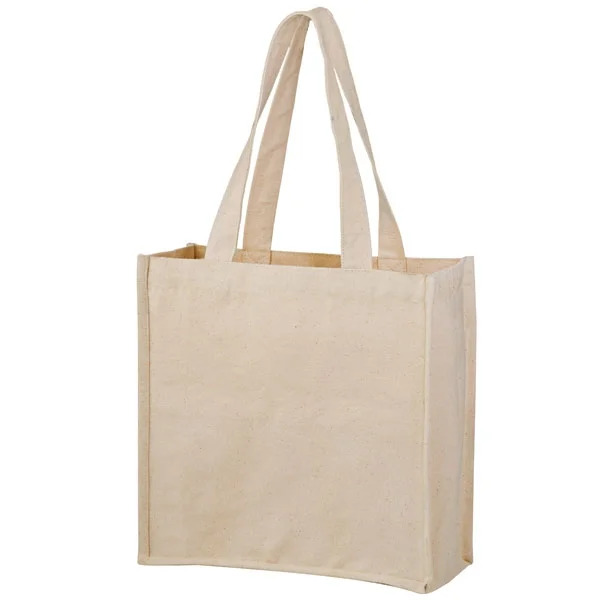 This bag is an eco-friendly option since it is constructed of cotton, which is renowned for its sustainability, tensile strength, and versatility. When you purchase this bag, you are sending a clear message to your customers that you care about the environment. Your customers in turn will tote this attractive bag wherever they go, spreading both your intended message and a green, eco-conscious message! We at Custom Earth Promos are devoted to delivering the best customer service and ensuring that your exact specifications are followed. We work with our overseas manufacturing facility to ensure that your products are delivered and arrive within the required time frame. We also only provide the highest-quality products at the most competitive rates in the business!